China flight tested a new variant of a long-range missile with 10 warheads in what defense officials say represents a dramatic shift in Beijing's strategic nuclear posture. The flight test of the DF-5C missile was carried out earlier this month using 10 multiple independently targetable reentry vehicles, or MIRVs. The test of the inert warheads was monitored closely by U.S. intelligence agencies, said two officials familiar with reports of the missile test. The missile was fired from the Taiyuan Space Launch Center in central China and flew to an impact range in the western Chinese desert. No other details about the test could be learned. Pentagon spokesman Cmdr. Gary Ross suggested in a statement the test was monitored. "The [Defense Department] routinely monitors Chinese military developments and accounts for PLA capabilities in our defense plans," Ross told the Washington Free Beacon. The test of a missile with 10 warheads is significant because it indicates the secretive Chinese military is increasing the number of warheads in its arsenal. Estimates of China's nuclear arsenal for decades put the number of strategic warheads at the relatively low level of around 250 warheads. U.S. intelligence agencies in February reported that China had begun adding warheads to older DF-5 missiles, in a move that has raised concerns for strategic war planners. Uploading Chinese missiles from single or triple warhead configurations to up to 10 warheads means the number of warheads stockpiled is orders of magnitude larger than the 250 estimate. Currently, U.S. nuclear forces—land-based and sea-based nuclear missiles and bombers—have been configured to deter Russia's growing nuclear forces and the smaller Chinese nuclear force. Under the 2010 U.S.-Russian arms treaty, the United States is slated to reduce its nuclear arsenal to 1,550 deployed warheads. A boost in the Chinese nuclear arsenal to 800 or 1,000 warheads likely would prompt the Pentagon to increase the U.S. nuclear warhead arsenal by taking weapons out of storage. The new commander of the U.S. Strategic Command, Air Force Gen. John Hyten, stated during a Senate confirmation hearing in September that he is concerned about China's growing nuclear arsenal. "I am fully aware that China continues to modernize its nuclear missile force and is striving for a secure second-strike capability," Hyten told the Senate Armed Services Committee. "Although it continues to profess a ‘no first use' doctrine, China is re-engineering its long-range ballistic missiles to carry multiple nuclear warheads and continues to develop and test hyper-glide vehicle technologies," Hyten added. "These developments—coupled with a lack of transparency on nuclear issues such as force disposition and size—may impact regional and strategic stability and are cause for continued vigilance and concern." The 10-warhead missile test comes amid heightened tensions with China. State-run media in recent weeks has carried reports calling for China to expand its nuclear forces. A broadcast report showed that new long-range mobile missiles could strike the entire United States. 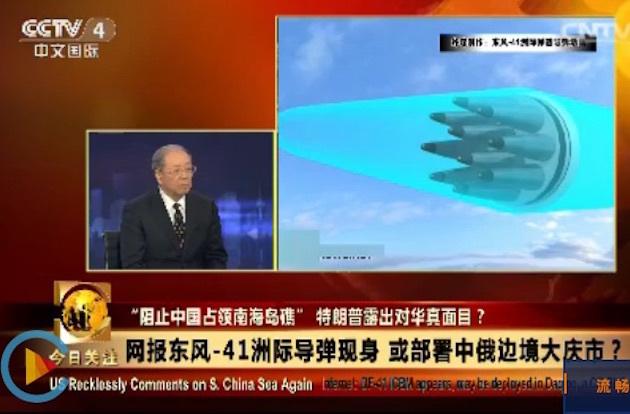 The Chinese state television channel CCTV-4 last week broadcast nuclear threats, including graphics showing new DF-41 missiles deployed in northern China and graphics showing the missiles' strike path into the United States. The Jan. 25 broadcast included a graphic of a 10-warhead MIRV bus for the DF-41. The Chinese Communist Party propaganda newspaper Global Times, known for its anti-U.S. stance, issued stark calls for China to build up its nuclear arsenal for use against the United States. On Jan. 24, the newspaper said China's strategic forces "must be so strong that no country would dare launch a military showdown." "China must procure a level of strategic military strength that will force the U.S. to respect it," the newspaper said. The same state-run organ criticized President Donald Trump in an article on Dec. 8 and said China should use its wealth "to build more strategic nuclear arms and accelerate the deployment of the DF-41 intercontinental ballistic missile." "We need to get better prepared militarily regarding the Taiwan question to ensure that those who advocate Taiwan's independence will be punished, and take precautions in case of U.S. provocations in the South China Sea," the newspaper said. China conducted a flight test of the DF-41 in April. Trump in December called for boosting America's aging nuclear arsenal. "The United States must greatly strengthen and expand its nuclear capability until such time as the world comes to its senses regarding nukes," he stated in a tweet. Military analysts said the large number of warheads is unusual for the Chinese nuclear program. Rick Fisher, an analyst with the International Assessment and Strategy Center, said the multi-warhead missile test appears to be aimed at sending a signal to the new Trump administration. Trump has tangled with China in opposing its military buildup on disputed South China Sea islands and on U.S. policy toward Taiwan, which Beijing regards as a renegade province and not an independent country. White House spokesman Sean Spicer said the United States is prepared to block China's access to reclaimed islands he said are located in international waters and not China's sovereign maritime domain. "This test of the 10-warhead DF-5C is China's latest nuclear intimidation exercise aimed at the new Trump administration," Fisher said. "China's nuclear intimidation signals have included the public revelation in late December via Chinese websites of the new DF-41 ICBM in Heilongjiang province, plus articles in China's state-controlled media touting the need for China to increase its nuclear forces to intimidate Washington," Fisher added. 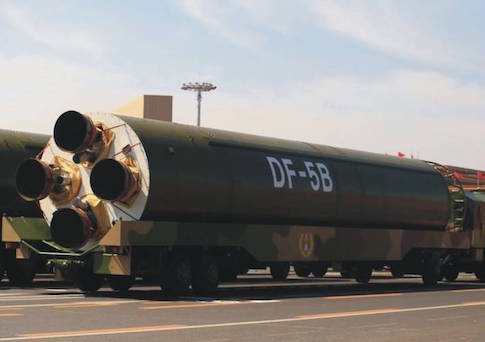 China's known force of around 20 D-5 missiles were deployed with large single warheads in the past, while some were upgraded with three-warhead top stages. In September 2015 China revealed for the first time during a military parade that it had deployed a new DF-5B multi-warhead missile. Unofficial published reports suggested the DF-5B carries between six and eight warheads. "The revelation that China has tested a new version of the DF-5 carrying ten warheads constitutes a very strong indication that China has produced a smaller warhead to equip its MIRV-capable ICBMs," Fisher said. Some analysts speculate that the recent test of the DF-5C used the older missile as a test platform for a new warhead delivery bus that will be used on the new DF-41. French China watcher Henri Kenhmann reported on his website East Pendulum that a Chinese missile test was to be carried out Jan. 15, based on air closure notices issued by the Chinese government for areas around Taiyuan and a missile impact range in western Xinjiang Province. Analysis of the impact range suggests the test would include multiple test warheads. "The point of impact is located south of the Taklamakan desert, in the former ballistic range of Minfeng," Kenhmann said, noting the Chinese had imposed an unusually large air exclusion zone of 125 miles around the impact zone. "It should be noted that this zone of ballistic impact is abnormally large," he stated, a sign the large area would be used for multiple dummy warheads. ‘The size of this impact zone could indicate testing several MIRVs," he said. A similar Chinese test of the DF-41 in April involved two MIRVs that were fired to a much smaller impact area of 60 miles by 37 miles. The Pentagon's latest annual report on the Chinese military said Beijing continues to upgrade its nuclear forces by enhancing silo-based missiles and adding new road-mobile missiles. "China’s ICBM arsenal to date consists of approximately 75 to 100 ICBMs, including the silo-based CSS-4 Mod 2 (DF-5) and multiple independently-targetable reentry vehicle (MIRV)-equipped Mod 3 (DF-5B); the solid-fueled, road-mobile CSS-10 Mod 1 and 2 (DF-31 and DF-31A); and the shorter range CSS-3 (DF-4)," the report said. 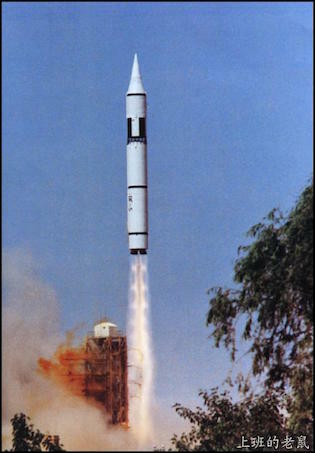 The DF-5 is a two-stage, liquid-fueled missile with a range of around 8,000 miles. This is destabilizing at best. It indicates the Chinese are moving from a strictly deterrent force, to a first strike orientation. In laymen's terms, it is the difference between just keeping the US honest, and playing to win. And I agree with it.